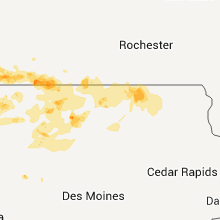 The Lawler, IA area has had 0 reports of on-the-ground hail by trained spotters, and has been under severe weather warnings 13 times during the past 12 months. 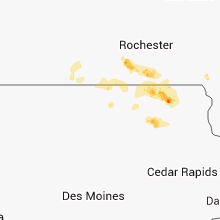 Doppler radar has detected hail at or near Lawler, IA on 28 occasions, including 5 occasions during the past year. 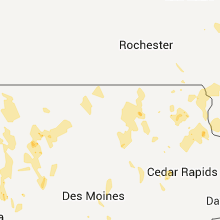 8/28/2018 9:39 AM CDT At 939 am cdt, a severe thunderstorm was located over waucoma, or 10 miles northwest of west union, moving east at 50 mph (trained weather spotters. this storm has a history of producing golf ball size hail and wind damage to trees). Hazards include golf ball size hail and 60 mph wind gusts. People and animals outdoors will be injured. expect hail damage to roofs, siding, windows, and vehicles. expect wind damage to roofs, siding, and trees. Locations impacted include, new hampton, fredericksburg, lawler, protivin, jerico, boyd, new hampton airport, county roads b 54 and v 56, county roads v 56 and b 33, saude, highway 18 and county v 56, highway 63 and county b 33, highway 63 and county b 22, little turkey, jacksonville and highway 18 63 and county b 54. 8/28/2018 9:32 AM CDT At 931 am cdt, a severe thunderstorm was located near lawler, or 9 miles east of new hampton, moving east at 50 mph (trained weather spotters. at 928 am cdt, golf ball size hail was reported just west of new hampton. this storm also has a history of blowing down trees). Hazards include golf ball size hail and 60 mph wind gusts. People and animals outdoors will be injured. expect hail damage to roofs, siding, windows, and vehicles. expect wind damage to roofs, siding, and trees. This severe thunderstorm will remain over mainly rural areas of eastern chickasaw county, including the following locations, county roads b 54 and v 56, county roads v 56 and b 33, boyd, saude and williamstown. 8/28/2018 9:19 AM CDT At 918 am cdt, a severe thunderstorm was located near new hampton, moving east at 50 mph (trained weather spotters. this storm has a history of producing quarter size hail). Hazards include 60 mph wind gusts and quarter size hail. Hail damage to vehicles is expected. expect wind damage to roofs, siding, and trees. this severe thunderstorm will be near, fredericksburg and lawler around 930 am cdt. Other locations impacted by this severe thunderstorm include county roads b 54 and v 56, county roads v 56 and b 33, boyd, saude and williamstown. 8/1/2018 6:05 PM CDT At 605 pm cdt, a severe thunderstorm was located near jerico, or 7 miles north of new hampton, moving east at 30 mph (radar indicated). Hazards include quarter size hail. Damage to vehicles is expected. this severe storm will be near, jerico and lawler around 615 pm cdt. Other locations impacted by this severe thunderstorm include alta vista, north washington, colwell, bassett and county roads b 33 and t 76. 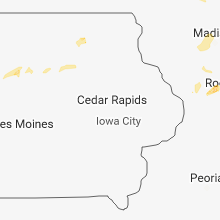 8/1/2018 5:49 PM CDT At 549 pm cdt, a severe thunderstorm was located near elma, or 11 miles northeast of charles city, moving east at 25 mph (radar indicated). Hazards include quarter size hail. Damage to vehicles is expected. this severe storm will be near, elma around 555 pm cdt. new hampton around 610 pm cdt. jerico and lawler around 615 pm cdt. Other locations impacted by this severe thunderstorm include alta vista, north washington, colwell, bassett and county roads b 33 and t 76. 8/1/2018 5:26 PM CDT At 525 pm cdt, a severe thunderstorm was located near floyd, or near charles city, moving east at 30 mph (radar indicated). Hazards include quarter size hail. Damage to vehicles is expected. this severe thunderstorm will be near, ionia around 545 pm cdt. elma around 550 pm cdt. new hampton around 600 pm cdt. jerico around 610 pm cdt. 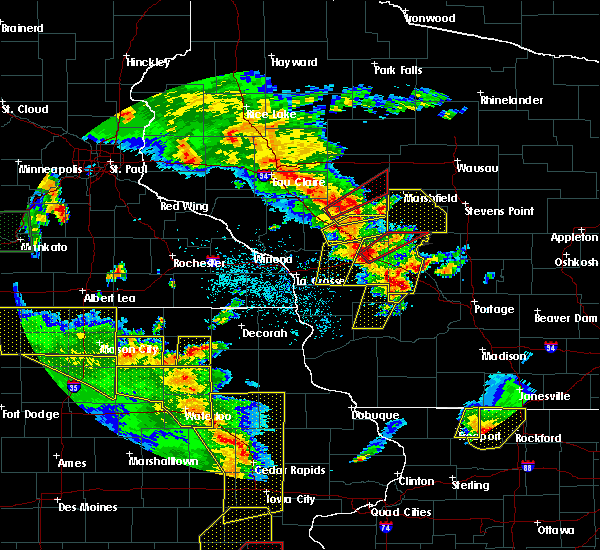 lawler around 615 pm cdt. Other locations impacted by this severe thunderstorm include alta vista, north washington, colwell, bassett and county roads b 33 and t 76. 6/9/2018 6:36 PM CDT The severe thunderstorm warning for chickasaw county will expire at 645 pm cdt, the storm which prompted the warning has moved out of the area. therefore the warning will be allowed to expire. a tornado watch remains in effect until 1000 pm cdt for northeastern iowa. 6/9/2018 6:16 PM CDT At 614 pm, a line of severe storms was now in eastern parts of chickasaw county, moving east at 25 mph. this includes the community of lawler. large hail and gusty winds have been reported (trained weather spotters). Hazards include 70 mph wind gusts. Expect considerable tree damage. damage is likely to mobile homes, roofs, and outbuildings. this severe thunderstorm will remain over mainly rural areas of chickasaw county, including the following locations: north washington, bradford, boyd, williamstown and new hampton airport. A tornado watch remains in effect until 1000 pm cdt for northeastern iowa. 6/9/2018 5:58 PM CDT At 557 pm cdt, a severe thunderstorm was located near new hampton, moving east at 25 mph. 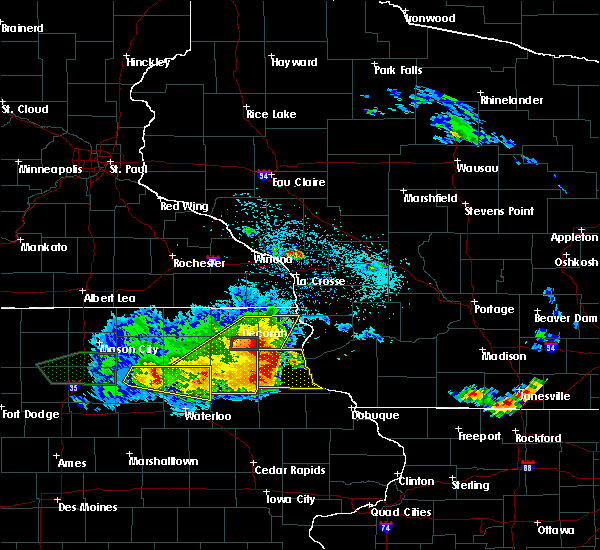 another severe thunderstorm was tracking across southern floyd county, north of greene iowa (radar indicated). Hazards include 70 mph wind gusts. Expect considerable tree damage. damage is likely to mobile homes, roofs, and outbuildings. this severe thunderstorm will be near, fredericksburg around 605 pm cdt. 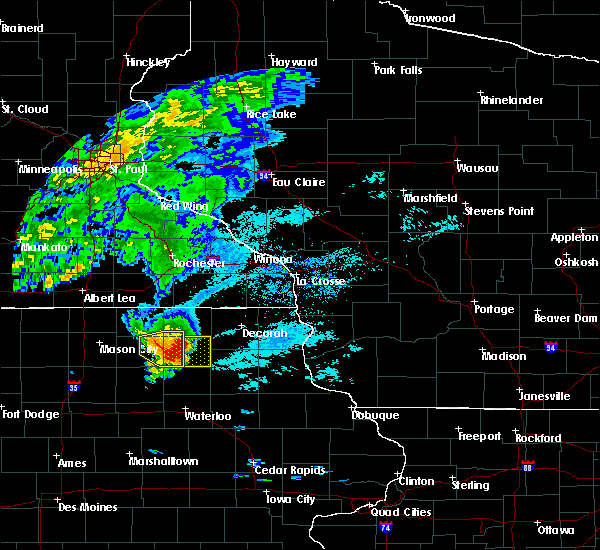 lawler around 610 pm cdt. other locations impacted by this severe thunderstorm include chickasaw, north washington, bassett, bradford and new hampton airport. People attending heartland days should seek safe shelter immediately! this warning extends the previous severe thunderstorm warning. 6/9/2018 5:44 PM CDT At 543 pm cdt, a severe thunderstorm was located just west of new hampton, moving east at 25 mph. this storm has a history of producing damaging wind and large hail (trained weather spotters). Hazards include 70 mph wind gusts and quarter size hail. Hail damage to vehicles is expected. expect considerable tree damage. wind damage is also likely to mobile homes, roofs, and outbuildings. this severe storm will be near, jerico around 550 pm cdt. fredericksburg and lawler around 600 pm cdt. other locations impacted by this severe thunderstorm include chickasaw, alta vista, north washington, colwell and bassett. people attending heartland days should seek safe shelter immediately! this warning will be extended past 6pm. A tornado watch remains in effect until 1000 pm cdt for north central and northeastern iowa. 6/9/2018 5:26 PM CDT At 525 pm cdt, a severe thunderstorm was located near ionia, or 7 miles east of charles city, moving east at 15 mph. there have been numerous reports of wind gusts of 60 to 80 mph and large hail with this storm (trained weather spotters). Hazards include golf ball size hail and 70 mph wind gusts. People and animals outdoors will be injured. expect hail damage to roofs, siding, windows, and vehicles. expect considerable tree damage. wind damage is also likely to mobile homes, roofs, and outbuildings. this severe storm will be near, ionia around 535 pm cdt. new hampton, fredericksburg, jerico and lawler around 600 pm cdt. other locations impacted by this severe thunderstorm include chickasaw, alta vista, north washington, colwell and bassett. People attending heartland days should seek safe shelter immediately! 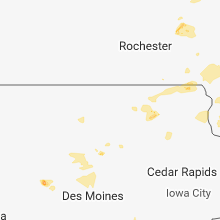 a tornado watch remains in effect until 1000 pm cdt for north central and northeastern iowa. 6/9/2018 5:01 PM CDT At 440 pm cdt, a severe thunderstorm was located over floyd, or near charles city, moving east at 35 mph (trained weather spotters). Hazards include golf ball size hail and 70 mph wind gusts. People and animals outdoors will be injured. expect hail damage to roofs, siding, windows, and vehicles. expect considerable tree damage. wind damage is also likely to mobile homes, roofs, and outbuildings. 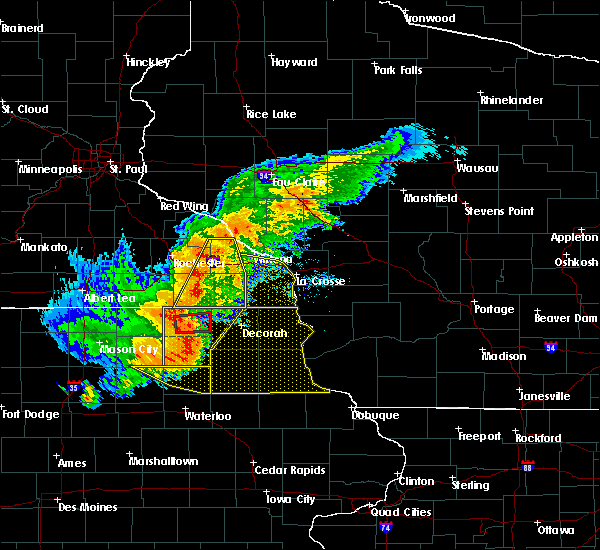 this severe thunderstorm will be near, charles city around 445 pm cdt. nashua around 500 pm cdt. ionia around 505 pm cdt. new hampton around 515 pm cdt. jerico around 520 pm cdt. fredericksburg around 525 pm cdt. lawler and protivin around 530 pm cdt. other locations impacted by this severe thunderstorm include chickasaw, alta vista, north washington, colwell and bassett. people attending heartland days should seek safe shelter immediately! this warning extends the previous severe thunderstorm warning for floyd county. 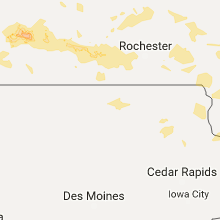 A tornado watch remains in effect until 1000 pm cdt for north central and northeastern iowa. 6/9/2018 4:41 PM CDT At 440 pm cdt, a severe thunderstorm was located over floyd, or near charles city, moving east at 35 mph (trained weather spotters). Hazards include golf ball size hail and 70 mph wind gusts. People and animals outdoors will be injured. expect hail damage to roofs, siding, windows, and vehicles. expect considerable tree damage. wind damage is also likely to mobile homes, roofs, and outbuildings. 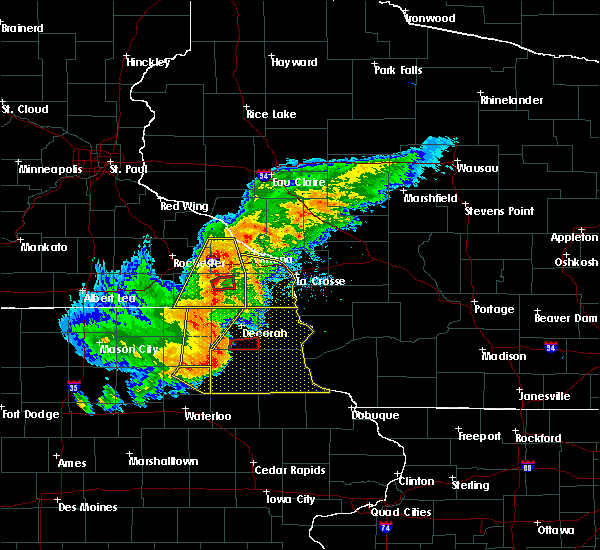 this severe thunderstorm will be near, charles city around 445 pm cdt. nashua around 500 pm cdt. ionia around 505 pm cdt. new hampton around 515 pm cdt. jerico around 520 pm cdt. fredericksburg around 525 pm cdt. lawler and protivin around 530 pm cdt. other locations impacted by this severe thunderstorm include chickasaw, alta vista, north washington, colwell and bassett. people attending heartland days should seek safe shelter immediately! this warning extends the previous severe thunderstorm warning for floyd county. A tornado watch remains in effect until 1000 pm cdt for north central and northeastern iowa. 7/22/2017 1:21 AM CDT At 121 am cdt, a severe thunderstorm was located near protivin, or 11 miles south of cresco, moving northeast at 20 mph (radar indicated). Hazards include half dollar size hail. Damage to vehicles is expected. 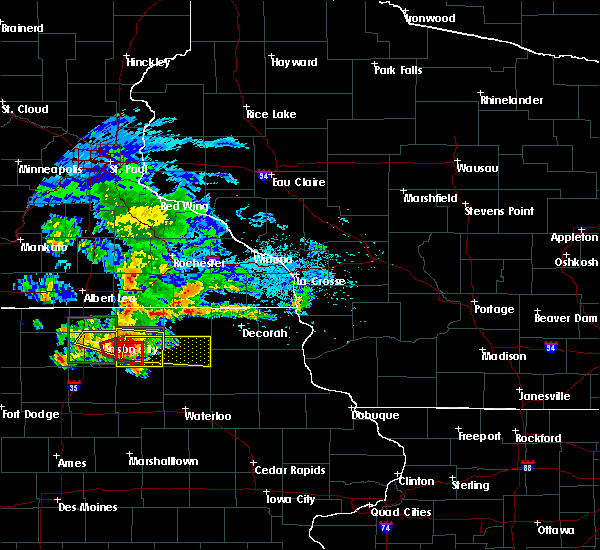 this severe thunderstorm will be near, protivin around 130 am cdt. 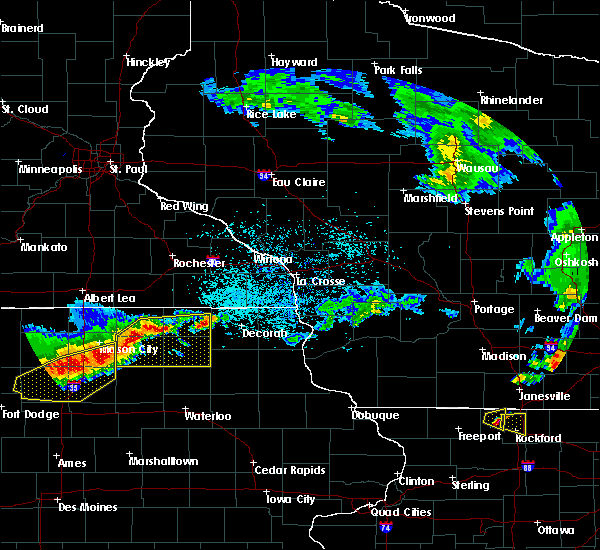 fort atkinson around 145 am cdt. spillville around 150 am cdt. ridgeway around 155 am cdt. Other locations impacted by this severe thunderstorm include jackson junction, lake meyer county park, county roads v 58 and a 46, bluffton and county roads v 56 and b 33. 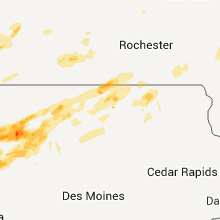 7/19/2017 5:42 PM CDT At 541 pm cdt, severe thunderstorms were located along a line extending from 7 miles southwest of canton to calmar to near hawkeye, moving east at 65 mph (trained weather spotters. 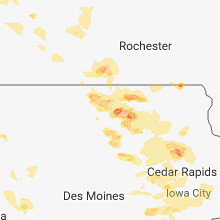 damage reports continue to be received across northeast iowa from these storms). Hazards include 70 mph wind gusts. Expect considerable tree damage. damage is likely to mobile homes, roofs, and outbuildings. These severe thunderstorms will remain over mainly rural areas of eastern howard, western winneshiek and eastern chickasaw counties, including the following locations: jackson junction, vernon springs county park, vernon springs, county roads v 58 and a 46 and bluffton. 7/19/2017 5:31 PM CDT At 530 pm cdt, severe thunderstorms were located along a line extending from near cresco to near protivin to near fredericksburg, moving east at 65 mph (trained weather spotters). Hazards include 70 mph wind gusts. Expect considerable tree damage. damage is likely to mobile homes, roofs, and outbuildings. these severe storms will be near, ridgeway around 535 pm cdt. Other locations impacted by these severe thunderstorms include chickasaw, alta vista, chester, north washington and bassett. 7/19/2017 5:09 PM CDT At 508 pm cdt, severe thunderstorms were located along a line extending from 6 miles southwest of le roy to 7 miles west of elma to near greene, moving east at 70 mph (trained weather spotters report winds of 65 to 70 mph with power outages and trees down in osage and charles city). Hazards include 70 mph wind gusts. Expect considerable tree damage. damage is likely to mobile homes, roofs, and outbuildings. these severe storms will be near, elma and ionia around 515 pm cdt. new hampton and nashua around 520 pm cdt. jerico and lime springs around 525 pm cdt. 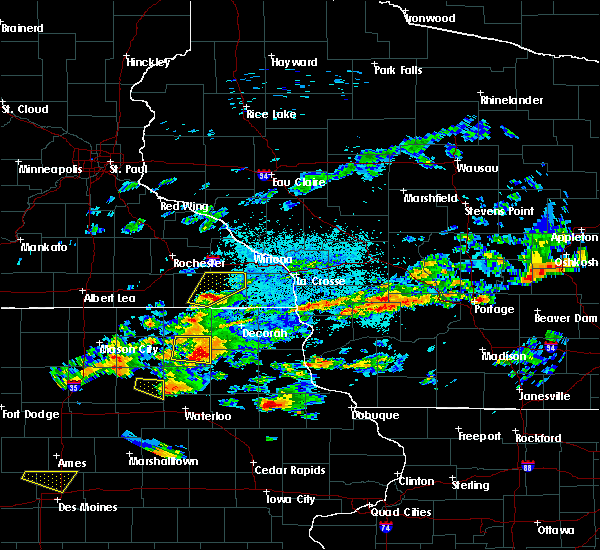 cresco, protivin and lawler around 530 pm cdt. Ridgeway and fredericksburg around 535 pm cdt. 7/19/2017 4:57 PM CDT At 455 pm cdt, severe thunderstorms were located along a line extending from near lyle to near osage to near rockwell, moving east at 65 mph (law enforcement. 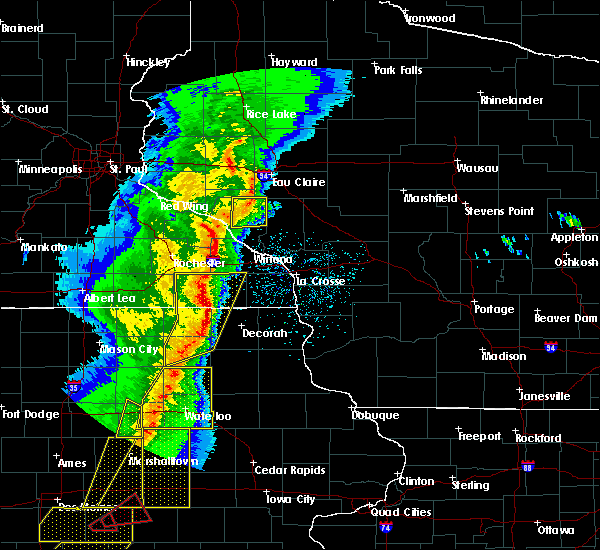 these storms have a history of 55 to 65 mph winds. 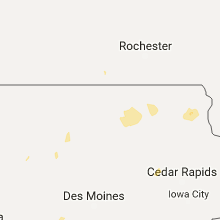 a measured wind gust of 65 mph was reported 2 miles north of charles city). Hazards include 70 mph wind gusts. Expect considerable tree damage. damage is likely to mobile homes, roofs, and outbuildings. 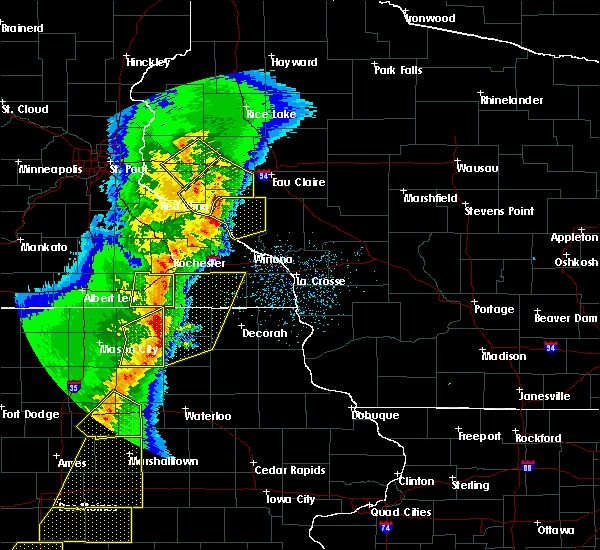 severe thunderstorms will be near, riceville around 510 pm cdt. 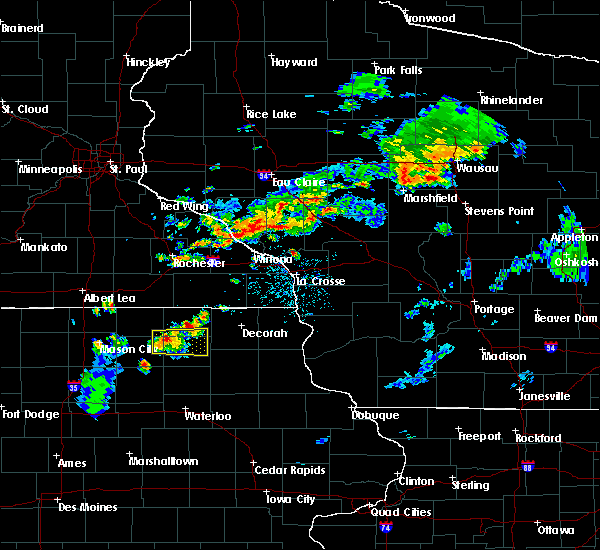 lime springs around 520 pm cdt. nashua around 525 pm cdt. cresco around 530 pm cdt. new hampton around 535 pm cdt. fredericksburg and lawler around 540 pm cdt. Other locations impacted by these severe thunderstorms include chickasaw, alta vista, chester, north washington and bassett. 6/28/2017 11:17 AM CDT At 417 pm cdt, severe thunderstorms were located along a line extending from near ossian to near fredericksburg, moving east at 50 mph (radar indicated). Hazards include 60 mph wind gusts and quarter size hail. Hail damage to vehicles is expected. expect wind damage to roofs, siding, and trees. these severe storms will be near, clermont, ossian and elgin around 420 pm cdt. west union and hawkeye around 430 pm cdt. other locations impacted by these severe thunderstorms include wadena, castalia, st. lucas, jackson junction and festina. A tornado watch remains in effect until 1000 pm cdt for northeastern iowa. 6/28/2017 11:04 AM CDT At 403 pm cdt, a severe thunderstorm was located over lawler, or 8 miles east of new hampton, moving east at 50 mph (trained weather spotters reported penny sized hail in new hampton at 345 pm). Hazards include 60 mph wind gusts and quarter size hail. Hail damage to vehicles is expected. expect wind damage to roofs, siding, and trees. 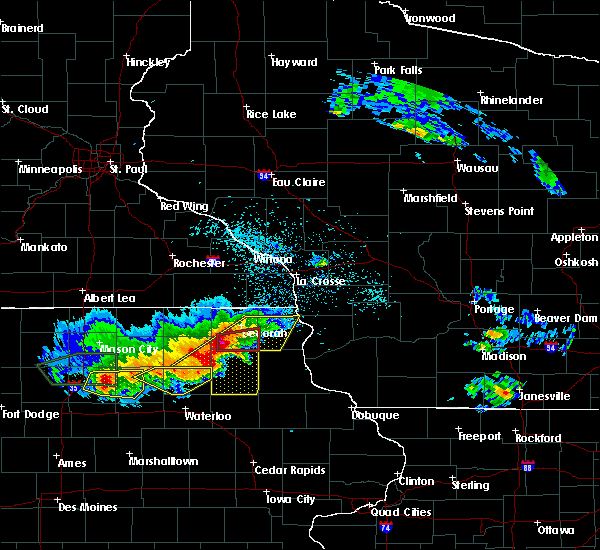 this severe storm will be near, hawkeye and fort atkinson around 415 pm cdt. calmar around 420 pm cdt. west union and ossian around 425 pm cdt. clermont and elgin around 430 pm cdt. other locations impacted by this severe thunderstorm include chickasaw, wadena, castalia, st. lucas and jackson junction. A tornado watch remains in effect until 1000 pm cdt for northeastern iowa. 6/28/2017 10:52 AM CDT At 351 pm cdt, a severe thunderstorm was located over new hampton, moving east at 60 mph (radar indicated). Hazards include 60 mph wind gusts and quarter size hail. Hail damage to vehicles is expected. expect wind damage to roofs, siding, and trees. this severe thunderstorm will be near, fredericksburg around 355 pm cdt. lawler around 400 pm cdt. waucoma around 405 pm cdt. 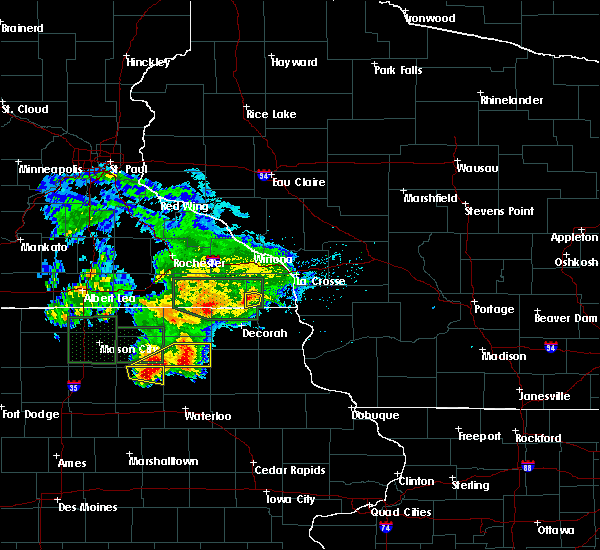 hawkeye and fort atkinson around 410 pm cdt. west union and calmar around 415 pm cdt. ossian around 420 pm cdt. clermont and elgin around 425 pm cdt. other locations impacted by this severe thunderstorm include chickasaw, wadena, castalia, st. lucas and north washington. A tornado watch remains in effect until 1000 pm cdt for northeastern iowa. 6/22/2017 9:51 PM CDT At 950 pm cdt, a severe thunderstorm was located near waucoma, or 11 miles east of new hampton, moving east at 30 mph (law enforcement). Hazards include quarter size hail. winds up to 50 mph are also possible. Damage to vehicles is expected. This severe thunderstorm will remain over mainly rural areas of southeastern chickasaw county, including the following locations: boyd and jacksonville. 6/22/2017 9:33 PM CDT At 932 pm cdt, a severe thunderstorm was located over new hampton, moving east at 30 mph (law enforcement. this storm has a history of producing quarter size hail). Hazards include quarter size hail. winds up to 50 mph are also possible. Damage to vehicles is expected. this severe storm will be near, lawler and fredericksburg around 945 pm cdt. Other locations impacted by this severe thunderstorm include alta vista, north washington, county roads b 28 and v 18, highway 18 and county v 18 and county roads v 56 and b 33. 6/22/2017 9:08 PM CDT At 907 pm cdt, a severe thunderstorm was located near ionia, or 9 miles east of charles city, moving east at 30 mph (law enforcement. around 850 pm, quarter size hail was reported in floyd). Hazards include quarter size hail. Damage to vehicles is expected. this severe thunderstorm will be near, ionia around 910 pm cdt. new hampton around 925 pm cdt. 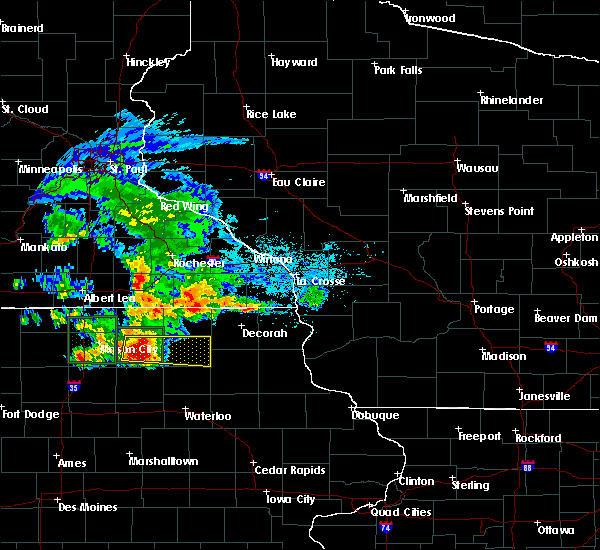 jerico around 930 pm cdt. fredericksburg around 940 pm cdt. 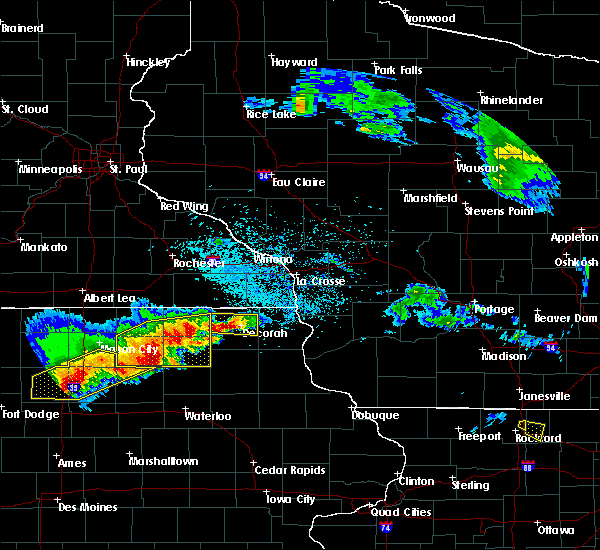 lawler and protivin around 945 pm cdt. Other locations impacted by this severe thunderstorm include chickasaw, alta vista, north washington, bassett and county roads b 28 and v 18. 5/17/2017 6:11 PM CDT At 611 pm cdt, a severe thunderstorm was located near tripoli, or 12 miles northeast of waverly, moving north at 70 mph (radar indicated). Hazards include 60 mph wind gusts and quarter size hail. Hail damage to vehicles is expected. expect wind damage to roofs, siding, and trees. this severe thunderstorm will be near, fredericksburg around 620 pm cdt. new hampton and lawler around 625 pm cdt. jerico around 630 pm cdt. 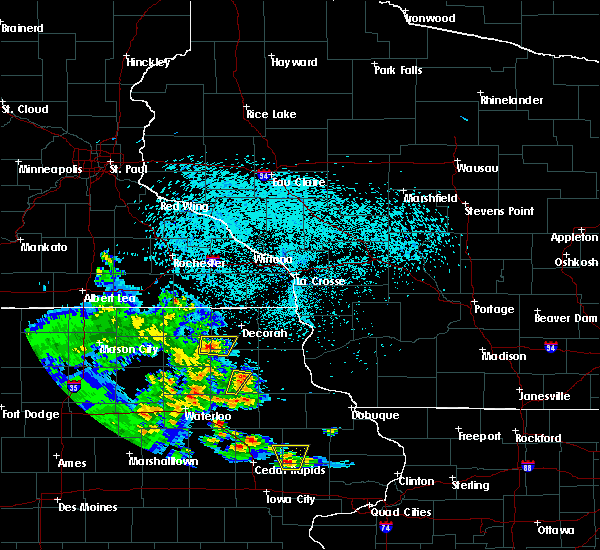 protivin around 635 pm cdt. other locations impacted by this severe thunderstorm include new hampton airport, republic, county roads v 56 and b 33, highway 18 and county v 56 and highway 63 and county b 22. 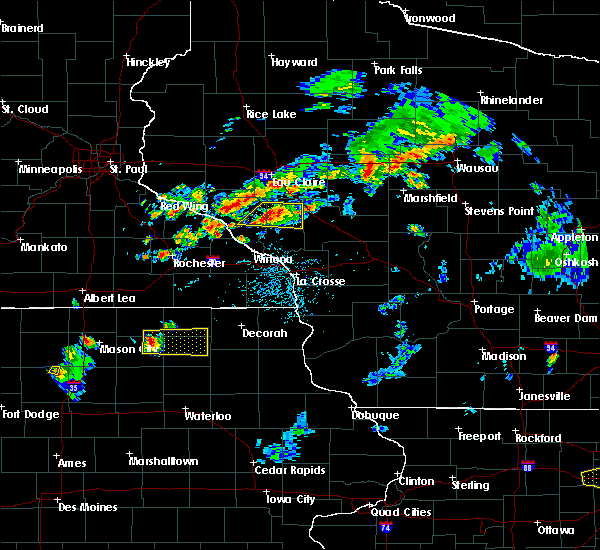 A tornado watch remains in effect until 1100 pm cdt for northeastern iowa. 5/16/2017 11:41 PM CDT The severe thunderstorm warning for howard and chickasaw counties will expire at 1145 pm cdt. 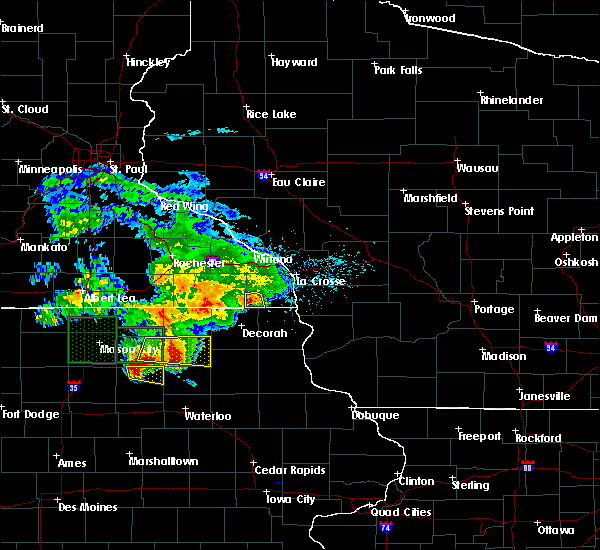 the storms which prompted the warning have moved out of the warned area. therefore, the warning will be allowed to expire. 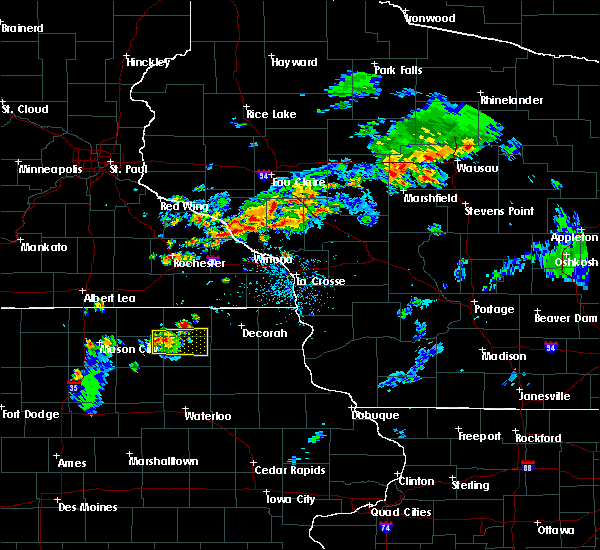 a severe thunderstorm watch remains in effect until 300 am cdt for northeastern iowa. Conditions remain favorable for severe. 5/16/2017 11:29 PM CDT At 1127 pm cdt, severe thunderstorms were located along a line extending from 6 miles north of lime springs to near fredericksburg, moving east at 35 mph (law enforcement. these storms have had a history of producing wind gusts of 60 mph and wind damage, including in alta vista). Hazards include 60 mph wind gusts. Expect damage to roofs, siding, and trees. These severe thunderstorms will remain over mainly rural areas of howard and chickasaw counties, including the following locations: chester, vernon springs county park and vernon springs. 5/16/2017 10:51 PM CDT At 1050 pm cdt, severe thunderstorms were located along a line extending from 6 miles east of stacyville to near nashua, moving east at 35 mph (radar indicated. these storms have had a history of producing wind gusts over 60 mph near interstate 35 mph). Hazards include 60 mph wind gusts and nickel size hail. Expect damage to roofs, siding, and trees. severe thunderstorms will be near, riceville around 1055 pm cdt. 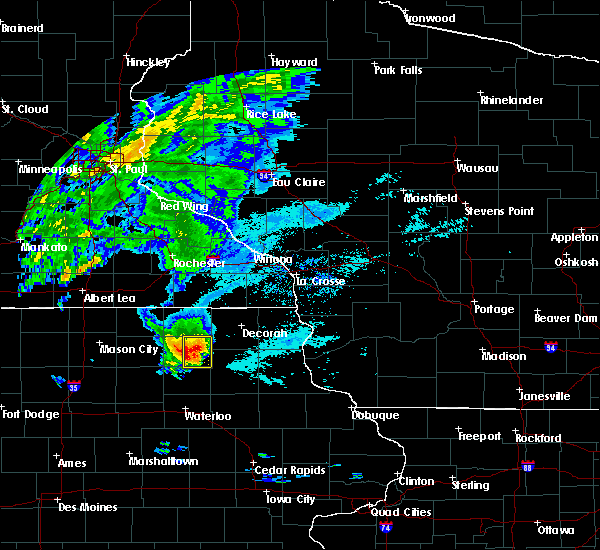 ionia around 1110 pm cdt. 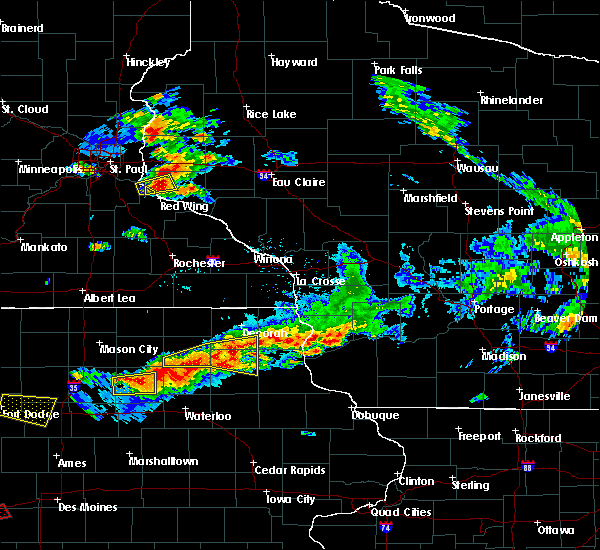 new hampton and lime springs around 1120 pm cdt. fredericksburg around 1125 pm cdt. 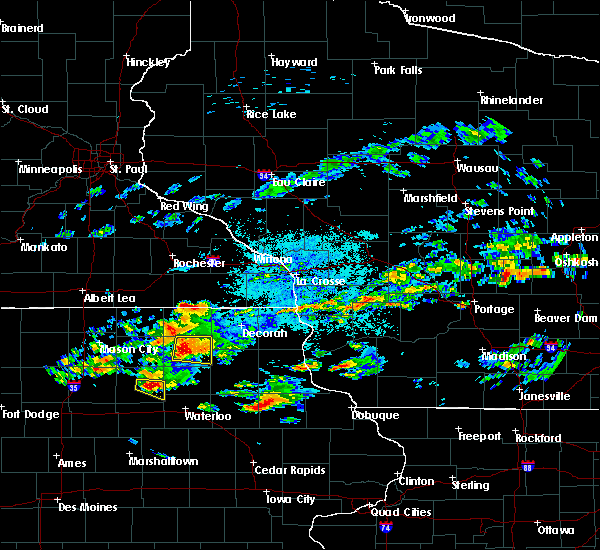 lawler around 1135 pm cdt. Other locations impacted by these severe thunderstorms include chickasaw, alta vista, chester, north washington and bassett. 5/15/2017 6:36 PM CDT At 633 pm cdt, severe thunderstorms were located along a line extending from near protivin to near nashua, moving east at 35 mph. trained spotters reported numerous trees down in nashua at 627 pm cdt (trained weather spotters). Hazards include ping pong ball size hail and 60 mph wind gusts. People and animals outdoors will be injured. expect hail damage to roofs, siding, windows, and vehicles. expect wind damage to roofs, siding, and trees. these severe storms will be near, cresco and protivin around 640 pm cdt. Other locations impacted by these severe thunderstorms include chickasaw, alta vista, north washington, colwell and bassett. 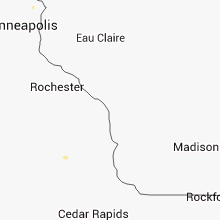 5/15/2017 6:16 PM CDT At 615 pm cdt, severe thunderstorms were located along a line extending from near cresco to near marble rock, moving east at 40 mph. quarter size hail and wind gusts to 60 mph were reported 3 miles south of charles city at 611 pm cdt (trained weather spotters). Hazards include two inch hail and 60 mph wind gusts. People and animals outdoors will be injured. expect hail damage to roofs, siding, windows, and vehicles. expect wind damage to roofs, siding, and trees. these severe storms will be near, cresco around 620 pm cdt. protivin around 625 pm cdt. nashua around 640 pm cdt. ionia around 645 pm cdt. Other locations impacted by these severe thunderstorms include chickasaw, alta vista, north washington, colwell and orchard. 5/15/2017 6:01 PM CDT At 559 pm cdt, severe thunderstorms were located along a line extending from near lime springs to 7 miles east of rockwell, moving east at 40 mph. quarter size hail and estimated winds to 60 mph were reported at 557 pm cdt near marble rock (trained weather spotters). Hazards include two inch hail and 60 mph wind gusts. People and animals outdoors will be injured. expect hail damage to roofs, siding, windows, and vehicles. expect wind damage to roofs, siding, and trees. 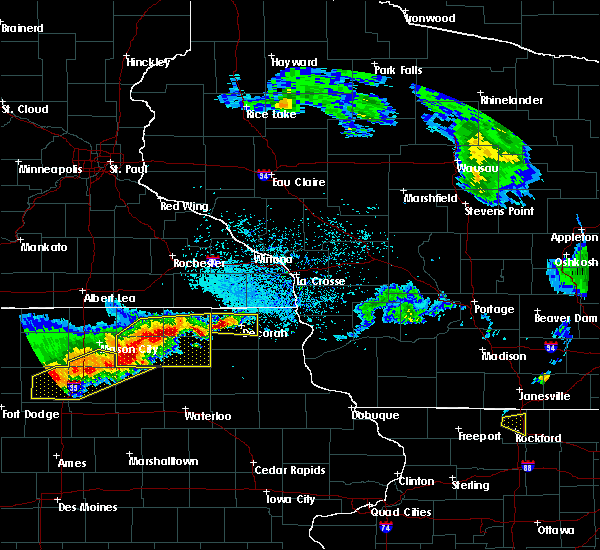 these severe storms will be near, elma around 605 pm cdt. 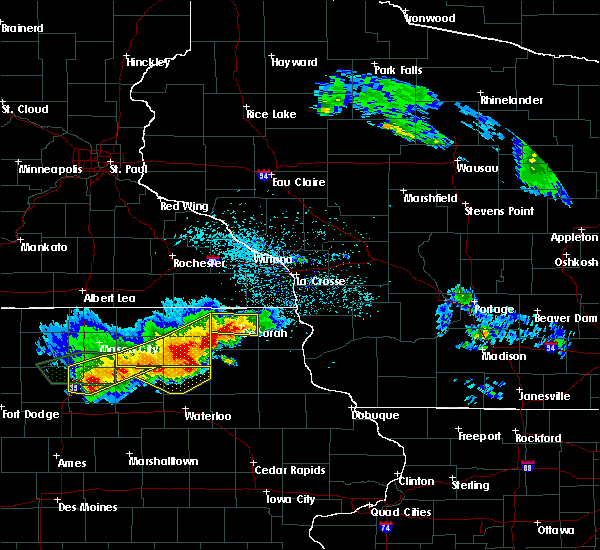 cresco and protivin around 620 pm cdt. charles city around 625 pm cdt. 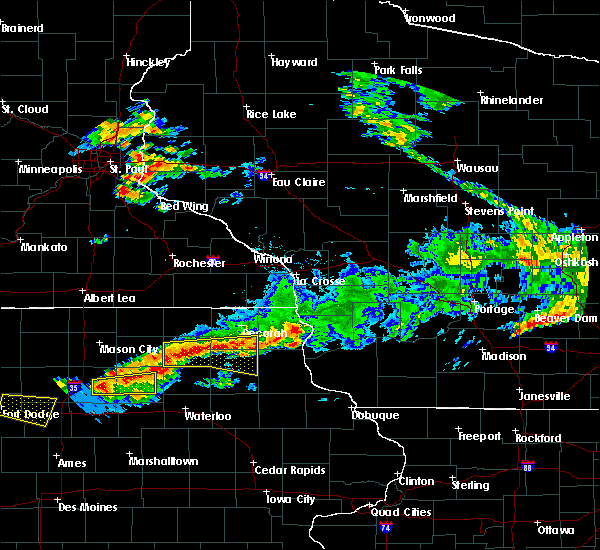 nashua and ionia around 640 pm cdt. new hampton around 645 pm cdt. Other locations impacted by these severe thunderstorms include chickasaw, alta vista, mitchell, north washington and colwell. 5/15/2017 5:49 PM CDT At 548 pm cdt, severe thunderstorms were located along a line extending from near riceville to rockwell, moving east at 40 mph. law enforcement reported a few trees and power lines blown down in osage (trained weather spotters). Hazards include two inch hail and 60 mph wind gusts. People and animals outdoors will be injured. expect hail damage to roofs, siding, windows, and vehicles. expect wind damage to roofs, siding, and trees. these severe storms will be near, riceville and elma around 555 pm cdt. cresco around 615 pm cdt. protivin around 620 pm cdt. charles city around 625 pm cdt. nashua around 635 pm cdt. ionia around 640 pm cdt. new hampton and fredericksburg around 645 pm cdt. Other locations impacted by these severe thunderstorms include chickasaw, alta vista, mitchell, north washington and colwell. 5/15/2017 5:40 PM CDT At 539 pm cdt, severe thunderstorms were located along a line extending from near riceville to near rockwell, moving east at 40 mph (radar indicated). Hazards include two inch hail and 60 mph wind gusts. People and animals outdoors will be injured. expect hail damage to roofs, siding, windows, and vehicles. expect wind damage to roofs, siding, and trees. severe thunderstorms will be near, riceville around 545 pm cdt. elma around 550 pm cdt. 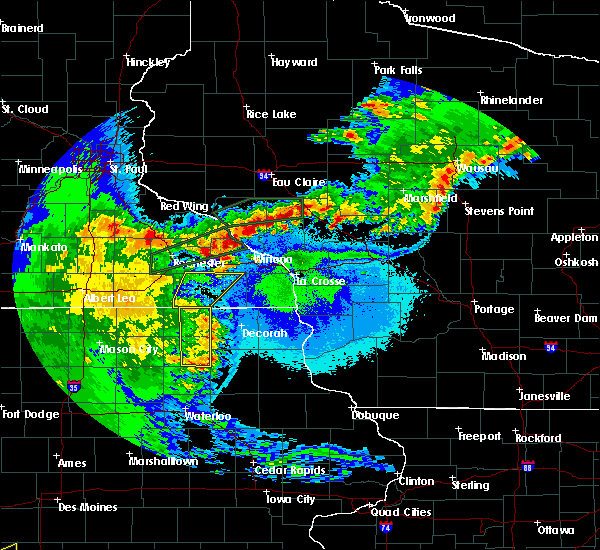 rockford around 600 pm cdt. marble rock around 610 pm cdt. 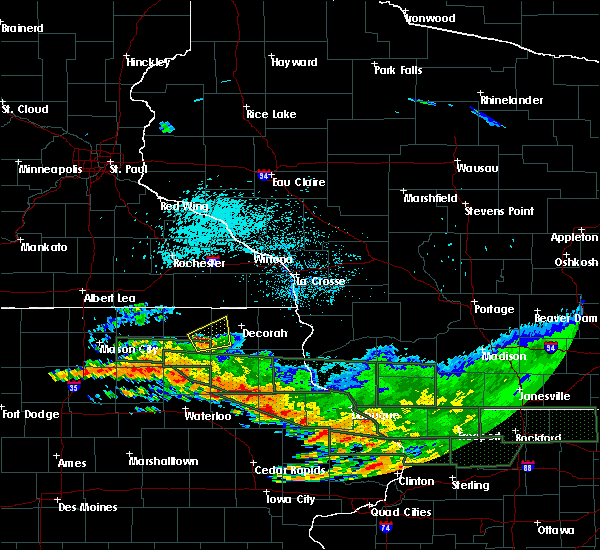 cresco and protivin around 615 pm cdt. charles city around 620 pm cdt. 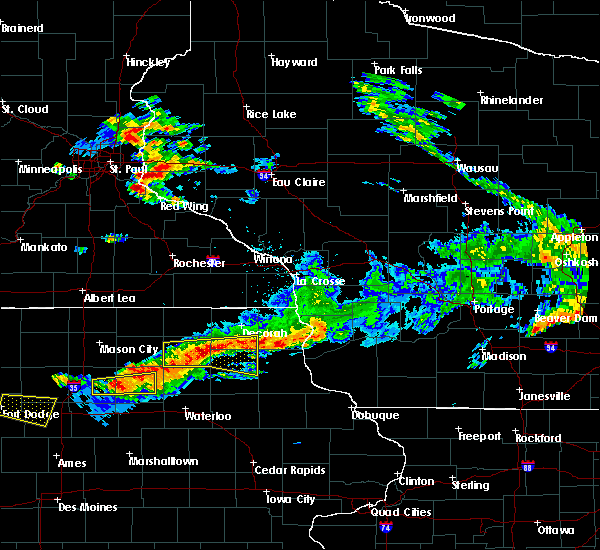 nashua and ionia around 635 pm cdt. new hampton and fredericksburg around 645 pm cdt. Other locations impacted by these severe thunderstorms include chickasaw, alta vista, mitchell, north washington and colwell. 3/6/2017 7:40 PM CST At 737 pm cst, severe thunderstorms were located along a line extending from near chatfield to near lawler, moving east at 50 mph (law enforcement. 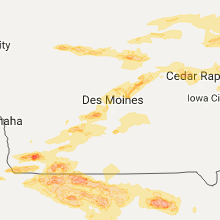 these storms have a history of producing wind damage in northeast iowa, north of charles city iowa). Hazards include 60 mph wind gusts and penny size hail. Expect damage to roofs, siding, and trees. these severe storms will be near, preston, fountain and chatfield around 740 pm cst. lanesboro around 745 pm cst. ridgeway around 750 pm cst. rushford around 800 pm cst. the most intense portion of the storms is near lime springs and moving northeast toward southern minnesota and southern fillmore county. a tornado watch remains in effect until 1000 pm cst for northeastern iowa. A tornado watch also remains in effect until 1000 pm cst for southeastern minnesota. 3/6/2017 7:37 PM CST At 721 pm cst, severe thunderstorms were located along a line extending from near stewartville to near elma iowa and into ionia, moving northeast at 70 mph (law enforcement has reported isolated pockets of large hail and winds to 70 mph over the past hour with these storms). Hazards include 70 mph wind gusts and quarter size hail. Hail damage to vehicles is expected. expect considerable tree damage. wind damage is also likely to mobile homes, roofs, and outbuildings. 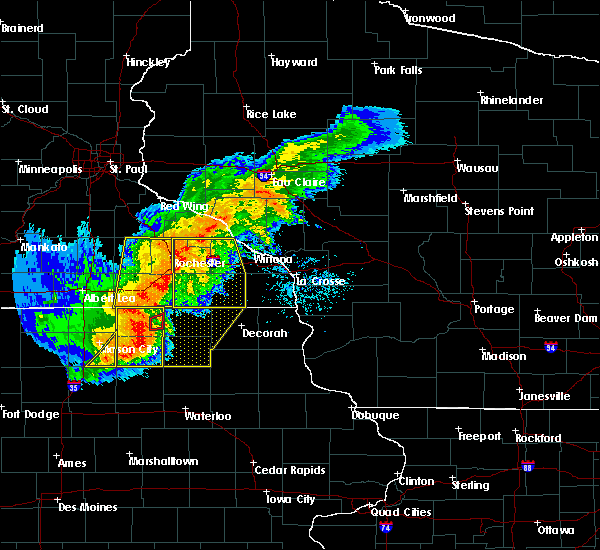 these severe storms will be near, chatfield around 725 pm cst. 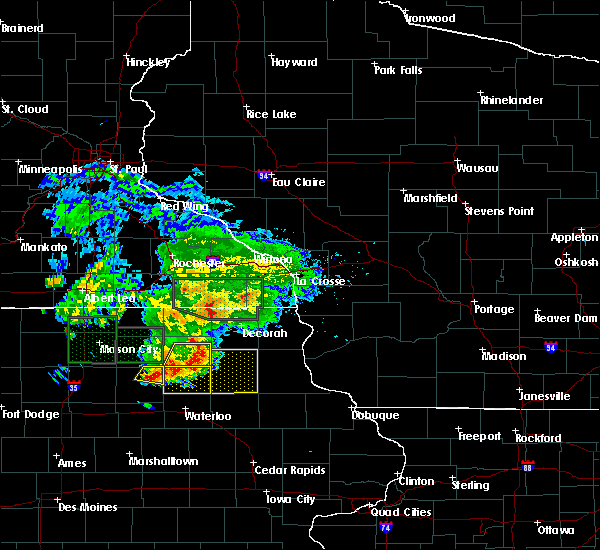 protivin around 735 pm cst. cresco, lime springs and ridgeway around 740 pm cst. canton and harmony around 750 pm cst. lanesboro around 800 pm cst. rushford around 810 pm cst. most can expect to see 50 mph winds, however pockets of very strong winds can develop anywhere on this line of storms. seek shelter as storms approach. a tornado watch remains in effect until 1000 pm cst for northeastern iowa. A tornado watch also remains in effect until 1000 pm cst for southeastern minnesota. 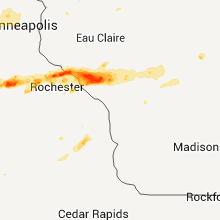 3/6/2017 7:13 PM CST At 710 pm cst, severe thunderstorms were located along a line extending from near chalres city to new hampton iowa, to east of austin minnesota, moving northeast at 60 mph (law enforcement has reported pockets of damaging winds with this line of storms over the past 30 minutes. hail damage to vehicles is expected. expect considerable tree damage. wind damage is also likely to mobile homes, roofs, and outbuildings. 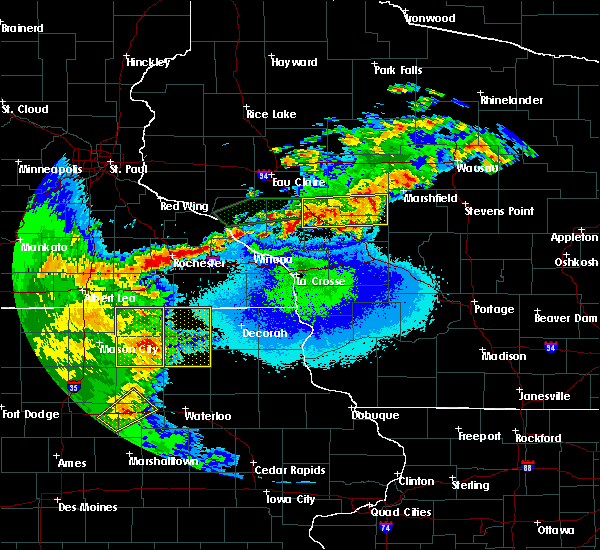 * severe thunderstorms will be near, lime springs around 720 pm cst. new hampton and spring valley around 725 pm cst. preston and harmony around 735 pm cst. fountain and chatfield around 740 pm cst. cresco and lanesboro around 745 pm cst. rushford around 755 pm cst. a tornado watch remains in effect until 1000 pm cst for northeastern iowa. a tornado watch also remains in effect until 1000 pm cst for southeastern minnesota). Hazards include 70 mph wind gusts and quarter size hail. 5/30/2016 8:54 PM CDT At 854 pm cdt, a severe thunderstorm was located near protivin, or 13 miles northeast of new hampton, moving northeast at 20 mph (radar indicated). Hazards include 60 mph wind gusts. Expect damage to roofs. siding. and trees. 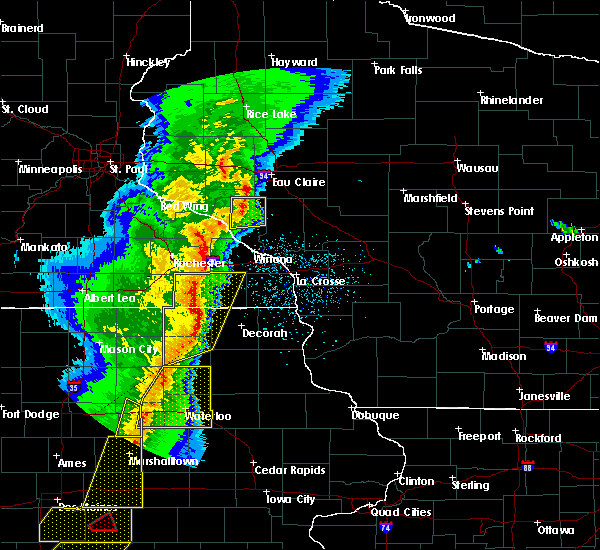 this severe storm will be near, fort atkinson around 905 pm cdt. 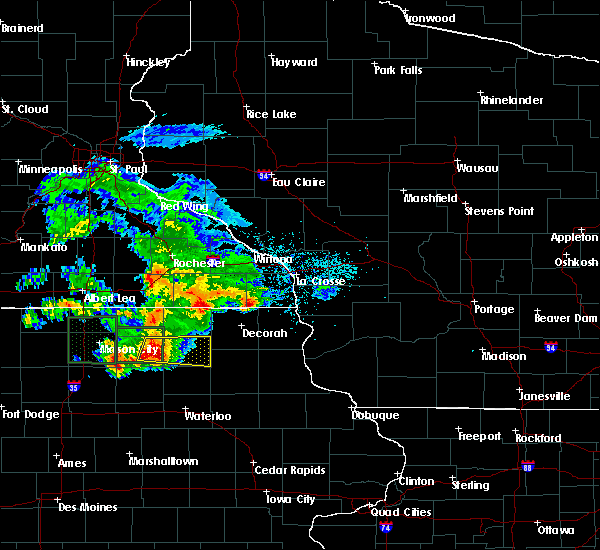 protivin around 910 pm cdt. spillville and calmar around 915 pm cdt. other locations impacted by this severe thunderstorm include st. Lucas, jackson junction, lake meyer county park, little turkey and county roads v 56 and b 33. 5/30/2016 8:35 PM CDT At 834 pm cdt, a severe thunderstorm was located over lawler, or 9 miles east of new hampton, moving northeast at 20 mph (radar indicated). Hazards include 60 mph wind gusts and penny size hail. Expect damage to roofs. siding. and trees. 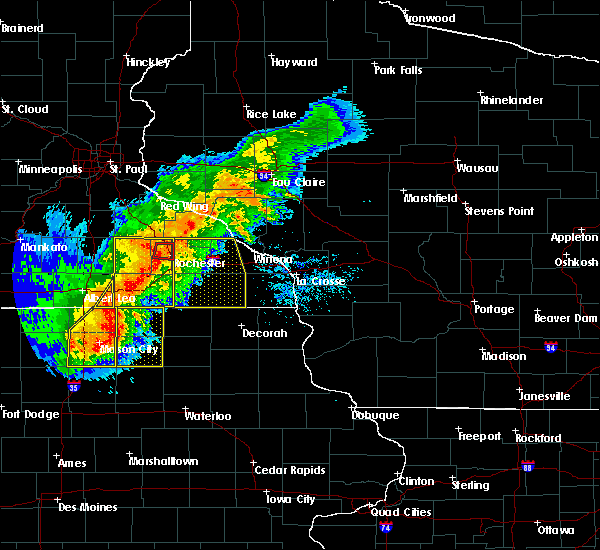 this severe thunderstorm will be near, waucoma around 840 pm cdt. 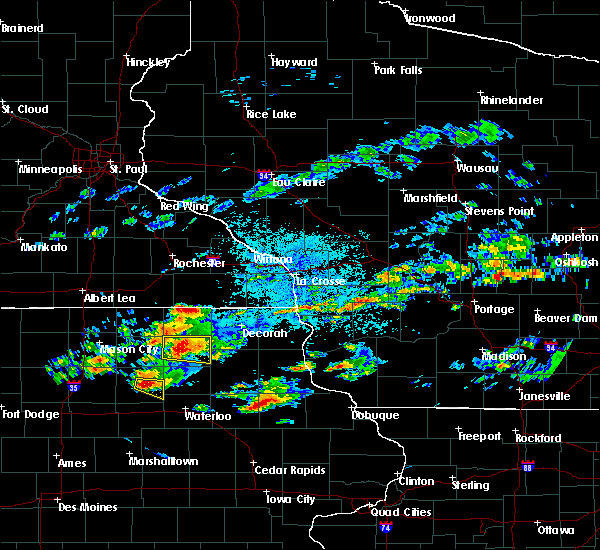 fort atkinson around 905 pm cdt. 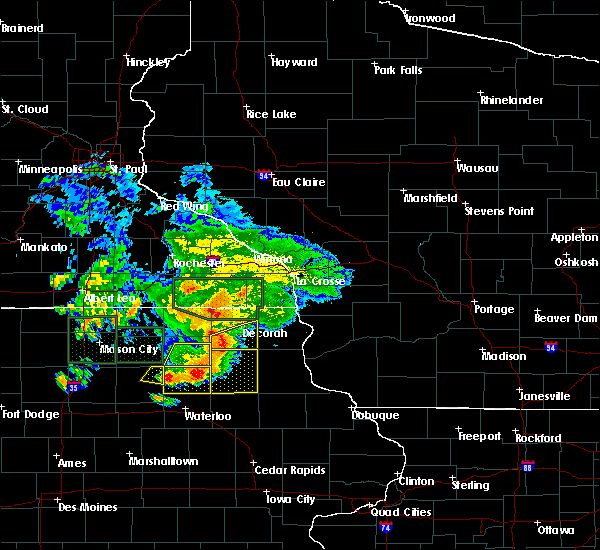 protivin around 910 pm cdt. spillville and calmar around 915 pm cdt. other locations impacted by this severe thunderstorm include st. Lucas, jackson junction, alpha, saude and highway 18 and county v 56.